You may have noticed that oversized hair bows are back, in a big way. 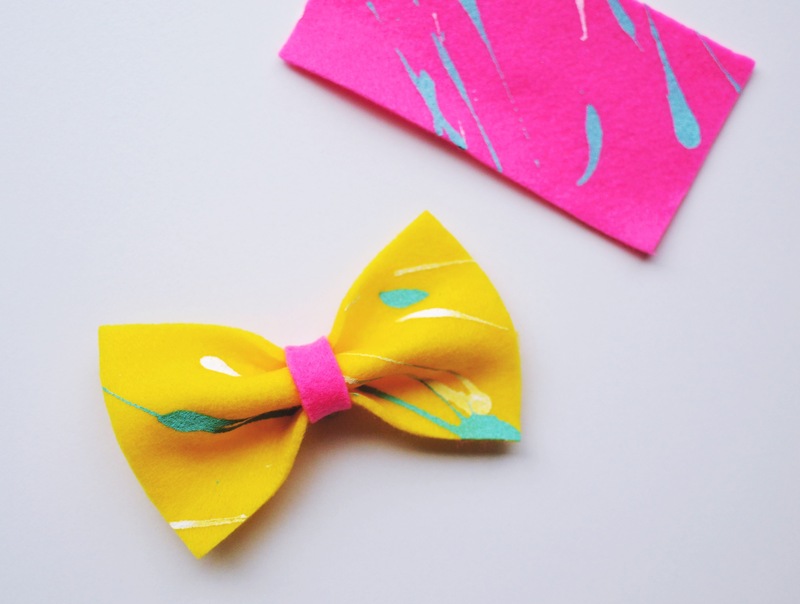 These paint splattered DIY felt hair bows are so easy to make, and they look super cute. And they only end up costing less than $3 per bow, provided you make a bunch. But you guys don’t craft to save money do you? I find that’s generally counterproductive. Anyway, please enjoy this DIY felt hair bow tutorial. I have to say ‘DIY felt hair bow tutorial’ as much as possible so Google will find this post. So please don’t think I have lost my mind, I’m just playing the game. Thread, yes… I know, I’m running very low. Lay out your felt (I used A4 sheets like these) on some paper and splatter paint all over it. I used the paint bottle at first but after that, I bought some small condiment bottles and used them for the squeezing/ splattering. After the paint is dry, cut out your big rectangle, whatever size you want your bow to be. Then cut out your small strip in whatever colour you want. I used yellow. Now squeeze your felt in the middle (like the picture above) so you get a bow shape and pop a stitch through it. Wrap your small felt strip around it, cross it over and the back and sew it to itself, not to the bow. Slide your clip into the strip and bam, that’s how you make a bow. And I made you a handy image to pin, it’s below.